Below are images of incremental carat sizes in every center-stone shape, shown on a hand model with a ring size of 5.75. Each stone is set into a ring and please note these are only close approximates as center-stone dimensions and length/width ratios can vary on stone by stone basis. At Lauren B we aim to give our clients the most well cut stones that achieve a balance of large face-up dimensions and high levels of sparkle. 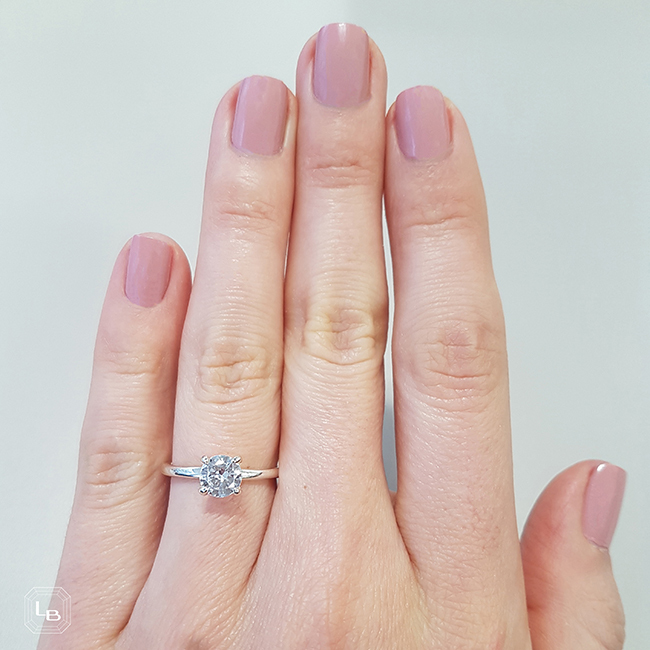 Below are images of incremental carat sizes in every center-stone shape, shown on a hand model with a ring size of 5.75. Round brilliants have the most precise, consistent cutting style therefore the dimensions below will be very accurate when based on an excellent cut stone. The below examples are based on the hybrid cushion brilliant which offers a large face-up appearance and a crisp sparkle. Shown here are stones with a perfectly square length to width ratio of 1:1. The below examples are based on the hybrid cushion brilliant which offers a large face-up appearance and a crisp sparkle. Shown here are stones with a rectangular length to width ratio of 1.1:1. This shape can vary greatly by length to width ratio and its depth percentage. The examples here are based on a desirable length to width ratio of around 1.4:1 and a well-proportioned stone in terms of depth. This cut is elongated by nature and shown here are ones with a desirable length to width ratio of approximately 1.55:1 and well balanced depth/table proportions. This step cut shape can have varying degrees of length to width ratios within an acceptable range of 1.2:1 for a wider look, and up to a more slender appearance at 1.45:1. Below are examples of stones that fall towards the middle of this range. This shape can have varying degrees of length to width ratios within an acceptable range of 1.2:1 for a wider look, and up to a more slender appearance at 1.45. Below are examples of stones that fall towards the middle of this range. One of the few shapes that are meant to only be square by nature, its sharp corners and fiery sparkle give it a distinct appearance. The most elongated of all the shapes, the examples below show marquise stones with length to width ratios of around 1.9:1. This romantic of shape features a pointed tip and two arches at the top separated by a distinctive cleft. Also known as a square emerald cut, this is the second shape which is truly square by nature. 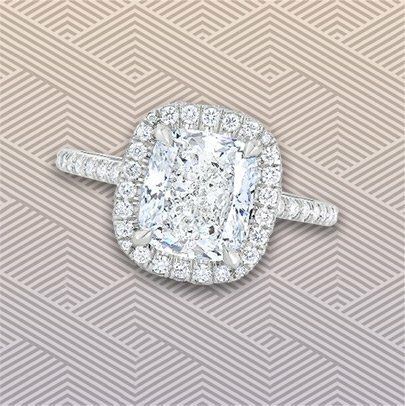 Unlike the princess cut, it features cut corners and step cut faceting.